Halls for rent from Advanced Tent Rental. Advanced Tent Rental Ltd. is a progressive, energetic company, which commenced business in Toronto in the summer of 1988. Since then, despite the cyclical fluctuations in the economic climate, we have steadily grown and now offer tents and temporary structures in sizes ranging from 10’ x 10’ to 100’ x 300’. Our rental inventory includes traditional pole tents, engineer-designed high peaked tension structures, traditional frame tents and clearspan aluminum structures. In order to complement our rental inventory we offer a full range of tenting options as well as related equipment and services such as canopies, flooring, lighting, décor items, heating, ventilation, electrical supply and distribution. 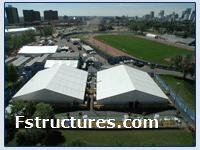 In December 2003, Advanced Tent Rental acquired Pike’s Tent’s, Canada’s oldest and best known source for event tent rentals for over 120 years. Customers can look forward to receiving a level of customer service that is unsurpassed in the industry and will benefit from the largest and most diverse inventory in Canada. "We realize that due to the nature of our business, we must be available to respond on short notice to our client’s demands. For this reason, all of our management team are available 7 days a week, 24 hours a day by means of cellular phone and emergency pager." Our tent rental operations are run from a 53,000 square foot facility located at 110 Citation Drive in Concord, Ontario, a suburb of Toronto. During our peak season we employ over 100 staff in administration, installation, dismantling, transporting, washing and warehousing of our equipment. In addition to warehouse storage for our tents, our facility features extensive state-of-the-art tent laundering and tent manufacturing operations. We are one of few rental companies in Canada with an in-house commercial tent laundry facility; we can process more than 1200 pounds of fabric per load and over 35,000 square feet of tent fabric per day. This capability is critical in ensuring that all tent tops and sidewall taken to jobsites are in a clean, attractive condition. We are directly involved in the manufacture of our own tents and sidewall systems. All tents are manufactured to precise, engineer-approved specifications and meet all Building Code & Fire Code standards for structural stability, flame resistance, and occupant safety. Having in-house manufacturing capability provides us with significant flexibility in providing newer tents in our rental operation. More information you can find at www.advancedtent.com.